Let’s see what’s going on up here for a bit. I was wondering if they would make a reappearance, also I think this is officially the third page titled “Feradin”. To my surprise, I think it’s actually the first! If I repeat a title, WordPress will add a `-#` to the end of the url. Also I was very much not expecting Feradin to show up again, which is why I felt OK giving her weird and complex patterns I assumed I’d never need to remember. Lesson learned, I suppose. Well, you’ve done really well so far remembering the complex patterns! I knew she’d reappear. I am excited to see her again. I’m very curious to learn her past, since she seems to know Toris on some level and relate to his “human” condition/ memories. I get the feeling she too might have previous memories from a human origin and trying to sort them out. It will be interesting to see what decisions she makes and if we get another demon ally or not. My suspicion is that FERADIN is the daemon that happened after Kori dies jumping down the well. Cannot be Halin, the playwright, as Halin’s name was stolen by CANATOPIS. * The cylindrical “totems” that appear below next to the bag in the very page look like that used to give a name (and thus control) to CANATOPIS. * In page “memories-2” the priest to whom Kori is talking is holding one of the cylindrical “totems” and they talk of the risk of memory retaining. * The god of Korisun is called “Antol” and has very different inconography from the god of Noridun “Hadol”, and yet in page “thanks” Anyalin gives thanks to the icon of Hadol on the great door to the well for keeping the demons away. * In the “good-night” page turns out that the world of Noridun has a moon which seems broken into pieces. * In the “found” page Scribbler says that Kohjen’s signs are all pointy. I hope that one day we get some “reveals” :-). I binged the comic in the last two days. It’s in my bookmarks now, so I’ll certainly be back. The story’s captivating, for a lack of a better word. 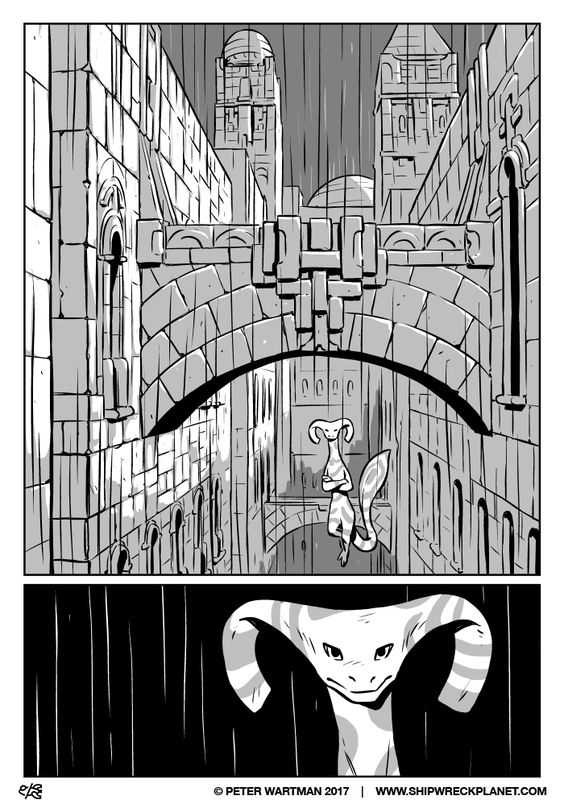 While I feel familiar with the whole ancient-civilization-fantasy-vibe, I’ve also never seen anything like it before… I love the detail in the backgrounds and buildings, and also the demons. They’re very unique, and I like how they feel like their own species and not like enslaved humans or robots. Now I’m going back to look at the pretty artwork. Today, I’ve already found myself doodeling Kohjen… she’s my favourite. Another detail: The builder speaks with “V” in place of “U”. Note the ancient scrolls telling the tale of the Stonebreaker is so far the only place I remember seeing that done. That leads me to suspect the builder’s human form might have come from that time period.